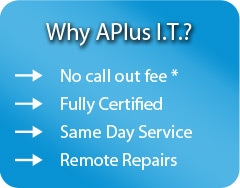 APLUS IT is one of the Gold Coast’s most respected computer repair businesses with over 10 years experience and a wonderful reputation for service and quality. We take great pride in providing fast, quality service from fully trained and accredited computer technicians – and we back this up with our simple 100% guarantee. We know how important time is for you – if you are looking for fast, reliable and affordable on-site computer services, you have come to the right place. We troubleshoot, diagnose, build, service, network, maintain and repair all IBM and compatible PC Hardware & Software. We will respond promptly and we’ll have you back in working order either the same day or the next day in most cases, because we know how important it is for you to have your PC running. Simply contact our friendly APLUS IT team for assistance and we’ll take great care of you!